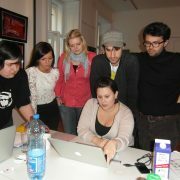 From the 24 – 26 th of February 2012 the YEN board and office had a meeting in Vienna. During the meeting we discussed the last preparation steps of the Easter Seminar in South Tyrol/Italy, worked out the agenda of the general assembly in five weeks and prepared the documents for this event. Next to this the board and office worked on the project “Handbook for beginners” which will be presented at the seminar in April. On behalf of the board the meeting was very effective and successful.